Derek Brown (at least through 2014) has been a very generous signer TTM. 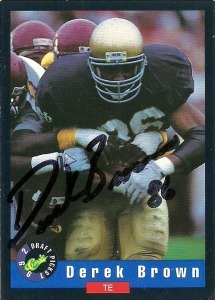 A first round pick of the New York Giants in 1992 and a member of the Notre Dame National Championship Team in 1988, Brown was an accomplished blocker with good career receiving statistics. His best year came in 1991 when he caught 22 receptions for 325 yards and 4 touchdowns for the Golden Domers. 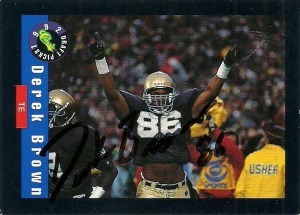 Over his time for the Fighting Irish, Brown compiled 62 receptions for 899 yards and 8 touchdowns in 34 games. The Giants were transitioning from the Bill Parcells era into the Ray Hadley ‘zone’. Hadley – the offensive mastermind behind the Giants Super Bowl XXV season, opted to make an upgrade at tight end. With Mark Bavaro walking after the 1991 season, the Giants were eager to upgrade at one of their most valued positions. Brown seemed like the perfect replacement for Bavaro and a no brainer at pick #17. The problem was the team was also going through a transition at quarterback as well. Phil Simms and Jeff Hostetler battled it out at quarterback, with the ‘heir to the franchise’ Dave Brown even taking snaps. 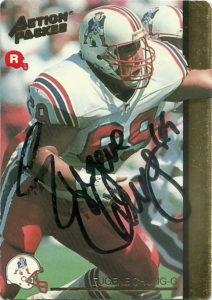 Unable to unseat Howard Cross at the position, Brown was relegated to 7 starts, as a second tight end and extra blocker in 1992, and none in 1993 or 1994. In 1995 the Jacksonville Jaguars and the Carolina Panthers joined the NFL as expansion franchises. Derek was selected by the Jacksonville Jaguars with the 47th pick. It made sense for Derek to go to the Jaguars as they were coached by Bill Parcells disciple Tom Coughlin. A near fatal hit in a preseason game sent Derek to the hospital for 10 days causing him to miss the entire season. He returned in 1996, recording a career high 17 receptions for 141 yards as the Jaguars made the AFC Championship Game. Derek returned in 1997 to the Jaguars, recording his first and only career TD reception in a game against the Dallas Cowboys. Derek joined Oakland in 1998, starting 4 games and making 7 catches in his one season there. He’d then play for the Arizona Cardinals through the 2000 season before ending his career. He currently lives in New York with his wife and children. Before the 1992 draft, Desmond was being touted as the next Rocket Ismail with electric speed that amazed and wowed fans. The Redskins after they won the 1991 SuperBowl traded up and picked Howard with the 4th overall pick. With a fleet set of receivers already that were seeing a bit of wear and tear (Monk, Clark, and Sanders,) the Redskins wanted Howard to be the lead receiver of the next generation of Skins receivers- but instead he was stuck on return duties. 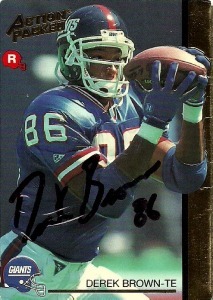 Desmond in 1994 recorded career highs in receptions (40), yards (727), and TDs (5), however with the emergence of Brian Mitchell, Howard had generally seen his playing time shrink as a return man. Usually this is a good thing for a receiver, but in Desmond’s case he found himself dangled out by the Redskins as part of the 1995 NFL Expansion Draft. Taken with the 55th pick by the Jacksonville Jaguars, Howard was sparsely used by the Jaguars on offense and special teams. Essentially fans thought he was washed up, but just as everybody gave up Howard, Desmond obviously had something left in him. Nobody really even blinked an eye when Desmond was signed via free agency by the Packers, who were looking for an extra spark in the return game. Howard displayed his signature abilities at returning, and destroyed special teams’ units single-handedly setting the NFL record for most punt return yards in a season with 875, and recorded 3 touchdowns. 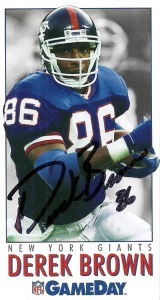 At the conclusion of the season, Desmond won the Super Bowl XXXI MVP honors, with a 99 yard touchdown return, and 244 total yards from scrimmage against the New England Patriots. Howard got snapped up by the Raiders after the season, and had a solid outing as a returner for the team leading the league with 1381 yards on 61 return in 1997. 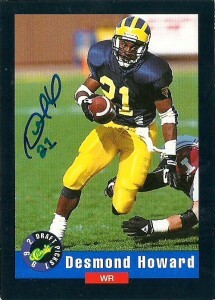 He also had a stellar 541 yards and 2 TDs punt returning in 1998 but he snubbed on Pro Bowl voting. Desmond was content to return to the Packers for a second stint in 1999, but found himself surprisingly traded to the Lions midway through 2000. It turned out to be a blessing as Howard reached the ProBowl for the first time in his career, after recording a 14.7 average on PR and 24.6 on KR. With injuries and age finally catching up with him in 2002, Howard decided to hang up his cleats after the season after establishing himself as one of the most explosive punt return men in league history. Desmond has gone into broadcasting where he has garnered quite a positive reputation as a public speaker and college football analyst, currently appearing on ESPN. In 2011 he was inducted into the College Football Hall of Fame and has appeared on the cover of NCAA Football 06 in his signature Heisman pose.